This is sweet. 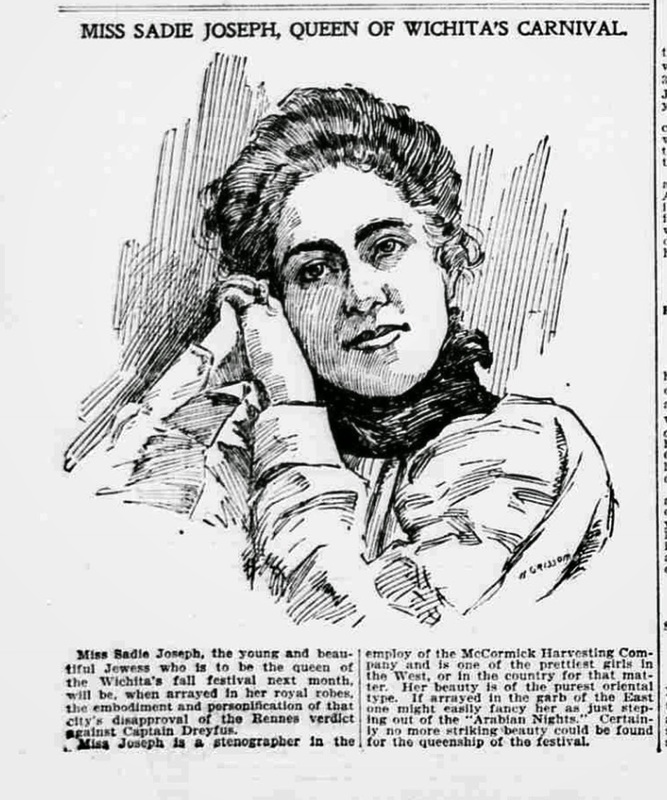 In 1899 Wichita, Kansas very nearly elected Miss Sadie Joseph queen of the Flower Parade at the Fall Carnival, because they really didn't like the verdict against Capt. Alfred Dreyfus in France. Some of the history books say she *was* elected, but I checked, and she just could not beat Miss Mayme Mahaney. However, many hearts were in the right place in this corner of The Music Man-era America. Great find. Note the then typical assumption that Jews weren't white, rather a race categorization of Oriental, like the characters of the Arabian Nights. It's refreshing to hear simple talk about a woman's beauty without having to wax on about her intelligence (which is not to say that she wasn't - see, I just did it). Fred, do you feel no loyalty to the lachrymose version of Jewish history. "Jewess" is a word that makes me smile. Almost as antiquated as "Negress." Yesh lachrymose ve-yesh lo lachrymose.